Perhaps the visit to the Musee Marmottan filled my Monet void and I will not choose to travel an hour by train to his home in Giverny. Or…perhaps that museum visit just left me wanting more. Right now I have left this time free, but thought it might be nice to take the train from the Gare Lazare to Vernon and then on to Monet’s final home. The town sounds quite picturesque and worth the trip. His home is open to view, and visitors are allowed to walk the paths in the garden and see his the famous waterlilies firsthand. I would try to leave on the first train out in the morning, however, in the hopes of avoiding some of the crowds so that I can actually take some floral photographs without the backsides of fellow tourists. The town also offers an Impressionism museum that sounds fascinating, and having lunch in a cafe outside the city of Paris may be the perfect way to relax after a week and half of constant travel. Ok — well, there was a bit of adjusting going on here. After the experience with Tony – my “pick up” guy – I have been a little leery to travel too far out of my comfort zone — and getting on a train to Giverny at Gare St. Lazare was definitely out of my comfort zone. So over the weekend I decided to splurge and take my chances on another tour. I had found this tour some time ago. The negative side of the tour was the cost (169 euros) and the fact that it received mixed reviews on Trip Advisor. However, over the weekend I decided to thoroughly read the reviews and it seemed for every negative review, there was a response from the company asking to be contacted so they could make it right. This seemed like a step in the right direction. In addition, this tour not only provided transportation to Giverny (if i took the train I would have to catch a bus or taxi from the station in Vernon to Monet’s house) — but it also included a second tour to Auvers – where VanGogh spent his last days. I threw caution to the wind – once again – and booked it. Unlike the wine tour yesterday – this tour picked me up right outside my apartment. Again, they were only about 5 minutes later than anticipated, so that was perfect timing in my book. The tour guide was not as polished as Jean-Bernard — and he was also training another guide, so most of his time was spent speaking french with her. There were only two others in the van, so we were a small group. Sylvain (the guide) was very good about pointing out areas of Paris that we might be interested in as we were leaving the city, and he provided good commentary about Monet on our way to Giverny. The others in the van were very quiet, so I assumed that this would be a very independent (and quiet) day. Which is not a bad thing in my book. It took about one hour to drive to Giverny – but we were able to park right away – obtain our tickets – and enter the gardens by avoiding the crowded lines. It was beautiful – spectacular – in fact, I am not sure that I could find “le mot juste” to describe these gardens. Almost sacred. There were numerous tourists, but all were quiet and respectful. The rainbow colors of the flowers – the tranquil lily pads floating in the water – the majestic weeping willows all worked together to provide the most serene setting. I spent about 30 minutes walking the pathways and taking pictures. Quite honestly – we could not have asked for better weather. It was raining in Paris when we left – but had dried up with cloudy skies when we arrived at the gardens. I think if it had been a sunny day the crowds would have been fierce – and it would not have been as enjoyable in the rain. Simply perfect. We then exited the gardens and walked towards the house. Flowers were blooming absolutely everywhere — and in every color and size and shape. I am not even a flower lover and I was swept away by the beauty. We entered the house and were able to tour (although not take pictures of) the living room – the salon where he painted – the dining room – the kitchen – and then venture upstairs to see two bedrooms and a hallway. It was fascinating to think that Monet walked these same stairs that I was climbing. I must admit that I was somewhat appalled by the actions of other tourists. We were politely told not to take pictures inside (and there were plenty of postcards available in the gift shop afterwards) and yet people were clicking right and left. One mother had her toddler child sit on one of the chairs to pose for a photographic — can you believe it?! I rushed out of the room before I was about to same something rather unkind. We were then able to visit the Impressionism museum which was currently exhibiting a collection of Impressionism paintings from the Clark collection. They were magnificent – several Renoirs, plus Degas, Manet, Monet, etc. The ideal part of this tour, I think, is that we were allowed a full two hours to see and do whatever we wanted. If we wanted to stay in the garden two hours and forego the house tour and museum, we could. While the guides did not actually lead us through the exhibits – to be honest – there was no need for them to do so. It was the absolutely the perfect amount of time to spend – and I spent it exactly the way I wished. We then climbed back inside the van and ventured to lunch at a lovely little restaurant, Le Moulin de Fourges, about twenty minutes down the road. The restaurant obviously caters to the tourist crowd – as we were placed in a separate building from the main house – but it was still very pleasant. Having led two student group tours to London, I must say I am accustomed to tour meals that are less than mediocre – but not so in this case. The three of us travelers were sat at a table together – and the two tour guides sat alone. This proved to be a wonderful idea. The three of us – all single women traveling together – opened up and shared a little bit about our lives. Chelsea was an Art History major at Arizona State University student who had just finished a four-week intensive language course in Lyon and today was her last day in Paris before heading back to the states. Margaret was probably a late 50s professor teaching art history 101 in Kuwait at the American University. We had an absolutely lovely chat together over a simple meal of salad – chicken with mushroom gravy and mashed potatoes – pomme tarte – red wine and coffee. It is highly unusual that these kinds of mass lunches are as tasty as this one – nor as inclusive. 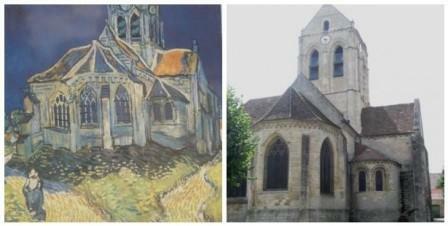 The next stop was Auvers – and Chelsea was a great admirer of VanGogh so she was able to share lots of information on the one hour drive. When we arrived we first visited his room where he spent his last days. Because others were superstitious of staying in a room of a man who committed suicide — all the furniture had been removed and the room left exactly as it was in July, 1890. The holes where he apparently hung his paintings to dry were evident – and a portion of the 7 square meter room has been partitioned with the hope of putting the original painting of “his room” for us to view. It was a sober experience. There was another room that we were able to visit where they actually have his iron bed and marble washstand set up the way they think perhaps it was originally placed. This room they have wallpapered in a sunny yellow and it is not nearly as sacred – although very interesting to view. The museum has also put together a fifteen minute video that chronicles the last few days of his life — marrying photographic images of the area at that time with his actual paintings of those places. We then walked from the restaurant above which he lived to the cemetery where he is buried next to his brother Theo. Along the walkway there are plaques that show a famous VanGogh painting next to the actual sight. One such place was at the “eglise” – and we were not only allowed to take pictures outside, but inside as well. It was then just a short walk up to the hill to the cemetery — very understated – where we found the two brothers’ graves. We later learned that it was just across from this cemetery where VanGogh shot himself – which led to his untimely death. All in all it was a very worthwhile experience. We then traveled back to Paris – only about 40 minutes away – and I arrived home a bit after 5:00PM. I am half tempted to go out and do something – and half tempted to stay home and relax, plan my last three days in Paris, and just relish the joy of these two tours. Wow, you've seen some fascinating sites on your trip. Thanks for sharing it all with us. I am oozing with envy, Molly! What a wonderful trip you are having and how I am enjoying the experience of it all from here. Thank you. Am so jealous! What a wonderful trip! Wow, that would be worth the trip to France right there. Monet and Van Gogh are two of my favorite artists. What a wonderful day! See what happens when you just throw caution to the wind??? You thoughtfully planned this trip, Molly. You seem very happy with the decisions you made. Very good.